The dinner is on the table, the milk has been poured, and everyone dives in. Well, everyone except one. There is one person at the table checking their phone. No. No. Not my daughters. Like many households, we have a no-device-at-the-table rule. Apart from the occasional reminder my kids have done well to remember and even respect this guideline. It has long been established that the dinner table is a great time to regroup and connect as a family. I am embarrassed to say, however, that there is a rising star in this rule-breaking – my husband. Having recently started a next chapter in his career he is more in demand than ever. Add this to our societal shift of “all things must be answered now” philosophy and you have a dinner-time-device debacle. Fellow blogger, Andrea, and I chatted about this after her screen-free vacation. Can you sit through a whole movie without googling who “that guy from something” is? Do you feel a wave of panic when you realize you forgot your phone at home? Have you picked up your phone to check the time and then lost an hour playing games or checking social media? 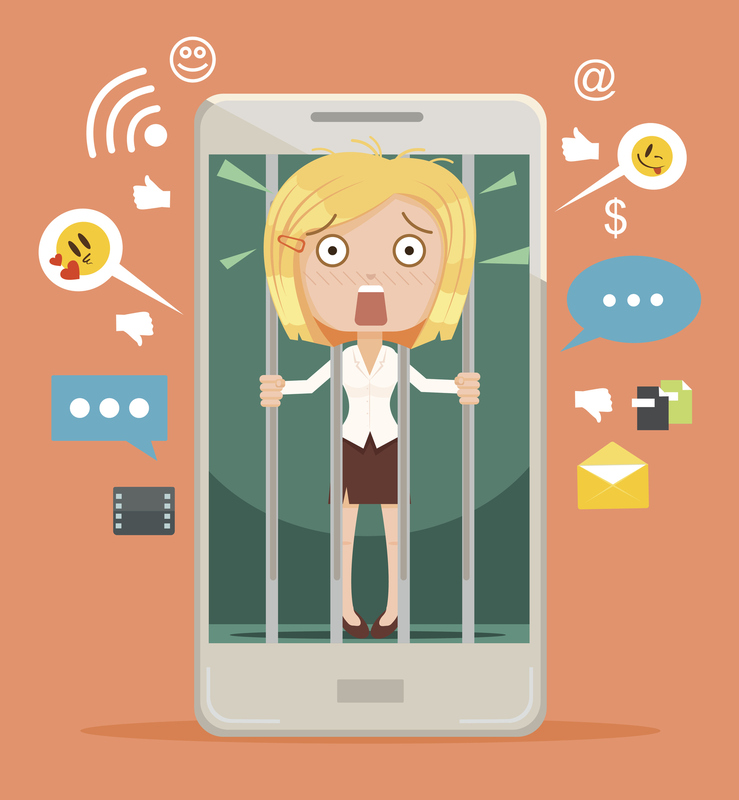 Do you feel anxious when your phone buzzes and you can’t check it right away? Has your kid gotten upset with you for missing something because you were on your phone? Well, how did you do? I said yes to more than I care to admit. Now remember, this is tongue in cheek. There is no validity in this test, but it did get me thinking. Can I be unplugged? Is it ok if I can’t be reached for an hour or two? Are we controlling our phone or is the phone controlling us? I can be better than this. I think a lot of us can. Put the phone away. Take your phone out of your pocket, pry it out of your fingers and leave it in a designated location in your home. Now if you are waiting to hear when your child needs picked up that’s one thing but otherwise do you really need it when you are folding laundry? Remember this isn’t just about parenting presence and role-modeling; this is about your overall mental health. It is exhausting being ‘on’ or ‘in demand’ all of the time. Turn notifications off. Allow yourself time to be unplugged. Turn notifications off during family time; meals, game night, story-time. Sure you won’t know right away if someone has texted you, but is that so terrible? Establish rules as a family. Family media contracts can help guide the conversation. There are many things to consider; social media and texting are part of it, but what about work or school use? My daughter’s school only offers online textbooks. That would need to be factored into our family contract. Use another way to communicate. Consider using the phone for its intended purpose. (Are you looking at me with a blank stare?) Have you ever reflected that some texts take longer to type than a call to share the information would take? There is a reason why my kids still don’t feel comfortable answering a phone. It rarely rings! But it is a good skill to have and sometimes the voice of a loved one really does trump an emoji. Power off and play. Nothing complicated here. Head to the park, go for a skate, play hide and seek. Don’t feel like heading outside? How about a puzzle, colouring book or game? Pick any activity that doesn’t require a screen and you are good to go. Healthy Kids Community Challenge has many tips and tricks for all ages! The advancement of mobile technology has provided many benefits, but there is a balance to be achieved here. It is still pretty new and we are still learning how to live with it. It is time to be mindful. Memories aren’t made behind a screen. Put your phone down. Go make some memories for the scrapbook of your life. Do you have any tips or thoughts on mobile dependency? Please share with us! We love to learn. This entry was posted in Babies, Children & Tweens, Parenting, Parenting Your Baby, Parenting Your Child/Tween, Parenting Your Teen, Parenting Your Toddler & Preschooler, Teens, Toddlers & Preschoolers and tagged adult, cell phone, dinner time, families, family, family time, limiting screen time, Mental Health, mobile, phone, play, screen addiction, screen time, stress. Bookmark the permalink. 2 Responses to Who’s the boss? You or your phone?